Heartwarming story that raised $400,000 takes a strange twist. In November 2017, a homeless guy (Johnny Bobbitt) noticed that a driver (Kate McClure) was stranded on a roadside … out of gas with no money or credit cards. So, Bobbitt gave “his last $20” to McClure to buy a couple of gallons of gas. McClure went on a PR blitz praising Bobbitt’s generosity. Then, McClure and her boyfriend (Mark D’Amico) set up a GoFundMe page to lift Bobbitt from homeless. The GoFundMe campaign raised almost $400,000. Bobbitt reportedly set up a bank account, bought a house and a truck, and started looking for job. A life-changing story that restores your faith in people, right? Bobbitt and McClure didn’t meet for the first time on that November night. They (and D’Amico) met at a NJ casino a couple of months earlier. That’s when they started hatching a plot for a masterful con. Yep, they allegedly fabricated the whole whole to raise the dough. BMW, trips, and, of course, more nights at the casino. They stopped shoveling money to Bobbitt, who soured on the relationship. So, he did what any red-blooded American would do: he got a lawyer and sued McLure and D’Amico for breach of contract. Problem: NJ law enforcers caught wind of the lawsuit and nailed the trio for the con. All 3 are being charged with conspiracy to commit fraud. And, faith in humanity is again restored to it rightful level of cynicism. 1. What was a homeless guy doing in the casino in the first place? 2. Why did the casino let the guy wander around to make new friends? 3. Why did these three people trust one another? 4. What lender gave Bobbitt (still unemployed) a mortgage? 5. Where and how did a homeless guy find a lawyer to file a law suit? 6. Didn’t Bobbitt (or his crack lawyer) think that the law suit might get noticed? 7. 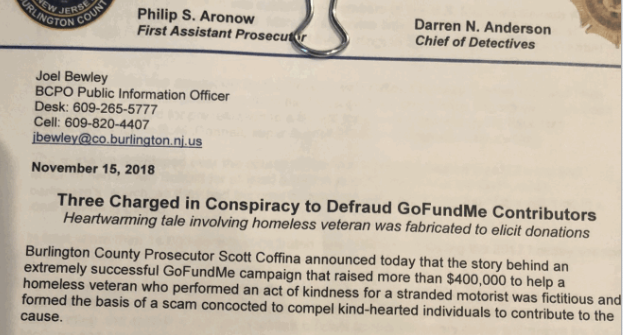 What happens to the people who fell for the GoFundMe scam? On the last point, GoFundMe has announced that it will reimburse everybody who contributed to the trio’s GoFundMe page and will take responsibility for pestering the trio into restitution. P.S. Two GoFundMe pages dedicated to Christine Blasey Ford’s legal and security expenses are reported to have raised over $700,000. Curious since her lawyers testified that they were working pro-bono … and the U.S. Senate was paying for her security detail. No word on whether GoFundMe will be returning those contributions, too. For more on this and other scams, see this Miami Herald recap. This entry was posted on November 16, 2018 at 6:59 am and is filed under Cons & scams., Ford, Dr. Christine, GoFundMe. You can follow any responses to this entry through the RSS 2.0 feed. You can leave a response, or trackback from your own site.